The beauty of a silent movie is its universality; no language barrier comes between you and the delight of the film. 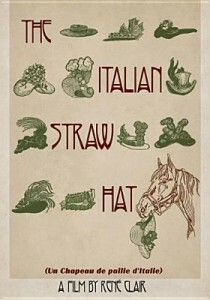 The Italian Straw Hat is a French movie whose alternate title pretty much tells the story: The Horse Ate the Hat. Fadinard, a young man on his way to his wedding, has a confrontation along the way when his horse eats the straw hat of a young married lady having a dalliance in the woods with an army officer not her husband. Feeling she can’t go home without the prized hat, the lady and her lover blackmail the young groom into finding a replacement hat. In the midst of trying to get married, trying to find a hat, trying to keep his relatives from finding the officer and his lady hiding in his apartment, Fadinard has quite a day. The comic timing and antics keep you laughing from beginning to end. Mary P. recommended this very good movie to me. 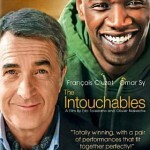 I was a little wary since The Intouchables is in French with English subtitles, but it was enjoyable and easy to relate to. Not extremely serious or comedic, this film is a great choice for many. 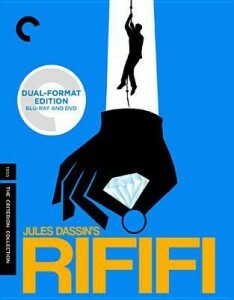 American born director Jules Dassin made the French thriller Rififi after being blacklisted in Hollywood. In this masterfully suspenseful heist movie, four jewel thieves plan the perfect crime. They gather the team. They plan. They rehearse. Then they execute the perfectly choreographed theft and getaway–all in perfect silence. But one mistake draws the unwanted attention of a local crime boss and all plans go astray. 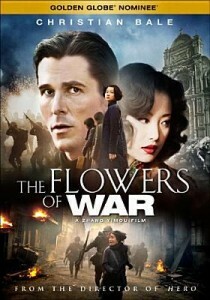 Set in 1937 Nanjing, China, as the Japanese invade and pillage the city during the Sino-Japanese War, The Flowers of War is a heart wrenching but very emotional story of the evils and atrocities of war. Thrown together as a means of survival, Christian Bale, an American mortician, a group of young Chinese school girls, and a band of courtesans hide in an old Nanjing church. With nothing in common, the three groups learn to pull together as death and destruction surrounds them. Bravery, romance, and wonderful acting from the entire cast make this Golden Globe nominated movie one not to miss. Even though this movie is listed as a foreign film, it is primarily in English, with small portions in Mandarin. Here’s a perfect movie to watch when you feel like you need a “romantic comedy.” This sleeper-of-a-movie stars Pierce Brosnan as a wealthy but grumpy widower who travels to Italy for his son’s marriage to a young Danish girl. As the two very different families meet to prepare for and celebrate their children’s wedding, love and hope for a wonderful future materialize. Quirky but warm and funny, Love Is All You Need just might fit the bill. 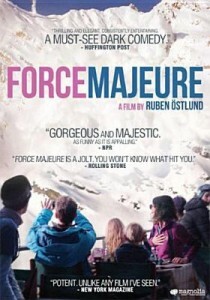 This is a moving French film about the power of love and loss. Rust and Bone stars Marion Cotillard as Stephanie, a killer whale trainer and Matthias Schoenaerts as Alain, a single father struggling to keep it together. Stephanie and Alain meet one night and later form an unlikely bond after Stephanie suffers from a life altering accident. A beautiful and emotional film that is a must watch. Kristin Scott Thomas gives an inspired performance in I’ve Loved You So Long, a French language film about a woman’s release from prison. The story of why she was in prison unfolds rather slowly throughout the film as she resumes her life and her relationship with her sister. The film is a modest, subtle character study and the value of most of it is in Thomas’ handling of the role. Just a side note: I wondered about the title…it didn’t seem to fit. And found that the phrase doesn’t translate very well (original title = Il y a longtemps que je t’aime) but is a line of a French folk song that two sisters played as a piano duet. Three French officers are captured and held as prisoners of war by the Germans in World War I. Lt. Marechal was a mechanic before the war; Lt. Rosenthal is from a wealthy banking family; and Capt. De Boeldieu is from an aristocratic military family. The camp commander, Capt. Fon Rauffenstein, feels a great affinity for Boeldieu, but Boeldieu sees that the world of de Boeldieus and von Rauffensteins has passed. This POW movie has many scenes we have learned to expect: the camp show, digging a tunnel and depositing the dirt in the garden, and unhappy Russians. The beautiful black and white cinematography, the humor, and the poignancy of each of the men’s stories make this a memorable movie. Missing this movie is strictly verboten! For more on the film, check out the articles on TCM.com. And for other films set during WWI, check out our recommended movie list. Produced in France in 1969, Director Jean-Pierre Melville’s film was not available in the U.S. until 2007. The “army of shadows” is a group of French Resistance fighters who must use their wits and courage to survive in the Vichy France as they spy on the Nazis and instigate acts of sabotage. This is not your typical action-packed war drama; instead, Melville focuses on the fighters’ states of mind. In doing so, he captures the moral difficulties the Resistance encountered as they fight a brutal enemy and protect themselves and comrades whose arrests or mistakes placed them in danger. For more on the film, visit the Criterion Collection website, plus Rotten Tomatoes and Roger Ebert.